Have you ever tried to stay awake for too long or getting too little sleep over a longer period with stress, for instance up to a deadline. Then try imagining how you felt when that was at its worst and think of how hard everything suddenly became, because you had no more energy. Then imagine that you could feel like that at any time without any reason. Well that’s how it feels for me. Suddenly out of the blue I get hit by this extreme feeling of fatigue, limbs get heavy, thinking straight becomes impossible and I start to lose the sense of what is going on around me. It truly feels like the batteries just went dead. This kind of fatigue hits me several times a week and in all kinds of situations. Although I have lived with POTS for several years now, it is still almost impossible for me to predict when I will feel this special kind of fatigue. Sometimes it even hits as soon as I step out of bed, as if my sleep had used up all my energy. And it really do come out of the blue, like someone hit me in the head with a shovel. So one minute I can be normal and the next I’m exhausted. Many people mistake this for just being tired and therefore don’t understand why I can’t just pull myself together and push on. Well, think of the example above about how one feels after many days of stress and no sleep. There’s not much energy left then, is there? And that how this is. The energy tank is suddenly empty, and no matter how hard you try “to pull yourself together” it does not work. Of course sometimes you must try to push the fatigue in front of you. For instance if you get hit by the fatigue hammer when you are walking in traffic, then you must do something to get to a place, where you can collapse. Many a time I have dragged myself home in such situations just to have an ‘attack’ when I get home, where my body freaks out in all the ways it can. So that is what you get from “pulling yourself together” … it will only make it so much worse. There are different degrees of this extreme fatigue. Some days I walk around feeling like a zombie from i wake up but without the feeling of an imminent and critical collapse. And I often need to take out a whole day in the calendar to just sleep, to get rid of that zombie-feeling. These instances are characterized by a feeling of being extremely tired and not being able to do much because of it. The more severe feelings of extreme fatigue are bundled with other symptoms like sudden muscle weakness, dizziness and cognitive problems. These periods of fatigue differs greatly in length and severity, and can in the worst cases be a sign, that a real ‘attack’ is on the way, where the POTS act out it it’s most extreme. 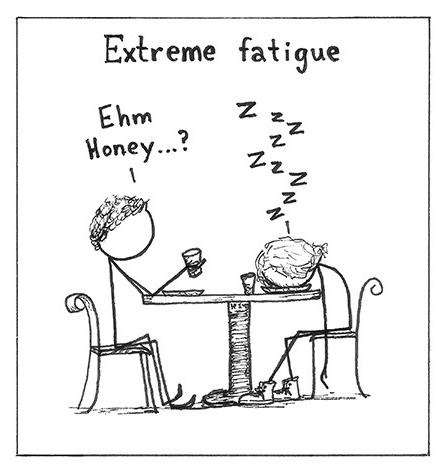 For me these fatigue attacks often seems to be triggered by eating. So it seemed clear that I needed to change my diet. I got the greatest results when I changed to a low-carb diet (please note that this diet does not help all POTS patients, so be careful when trying it out and talk to your doctor), so now food triggers extreme fatigue less often, but it has unfortunately not gone away completely. Lunch is especially a big trigger. And in some bizarre way it seems that lunch is a bigger trigger for me if I had breakfast. Before I changed my diet I almost felt the extreme fatigue all day everyday. After I changed it has definitely diminished in both frequency and severity. With a low-carb diet you must be careful not to skip meals, and this can be very hard when you feel like a zombie, but try to find either the energy to get food or get someone to help you get it. Also make sure you do not get dehydrated during these periods, since that will worsen the episodes, so drink a lot of water. The second major helper I found was regular exercise. This combined with the diet has giving me visibly more energy and it also seems to shorten the length of the fatigue episodes. I prefer to do yoga, but you might find another kind of exercise suits you better. I also combine the yoga with running a few km and doing some exercises to strengthen the leg muscles. But one must be careful with the exercise programs since exercise can also provoke the fatigue or some of the other POTS symptoms. So it is important to find the right balance in the duration and amount of you exercise. I have found out that it is important to respect the days where I feel like a zombie and just need to sleep, and that also means no exercise on those days. The days where it is the fatigue hammer that hits me, I have found that exercising a little (yoga) some hours after the fatigue has lifted helps to ensure that the fatigue does not hit again and diminish the tendency that I will feel like a zombie the next day. You will not feel like exercising at that point, but believe me it is worth pushing on at that moment. Breathing exercises also helps a lot and are especially important when the fatigue hammer hits. I meditate with a focus on the breath every day for at least 10 minutes, and try to be aware of my breathing as much as possible throughout the day ensuring to take deep breaths often. The breathing exercise also helps greatly when the fatigue hits, so focusing on your breathing while resting is a good idea. It also helps to make room in your schedule for such instances, in other words plan so your plans can be changed. Your life will get less stressful if you feel like you have the time to have these episodes. For instance since I know there is a higher risk after lunch, I try not to have anything planned for that time. Since I sometimes have to take a rest for half an hour to an hour at that time, I also try not to have plans right after the work day end, so I can catch up if I had lost some work hours to resting after lunch. It’s nice to know I’m not alone! I have a mild case of POTS and hypotension, and I get so tired in the afternoon. It often takes all of the strength within me not to nap, but I always feel so lazy. Try taking pink salt in capsules (if you have no kidney problems), helps me with all pots symptoms, especially fatique. I still have an ocassional episode, but way fewer than before salt. I take 6 capsules a day. Thank you for writing this! I too have POTS and forget that it is a REAL condition that can affect my daily life. It’s frustrating when you are feeing so good and then the fatigue sweeps you off your feet. It’s so helpful to hear other people talk about it and know it’s not just me! You just described me in this artical. Ohhh Cathy, I wish so much I could help you. I know how you feel and it is a tough battle to live with POTS. I hope you can stay strong and remember your not alone! explained me to a T. I have POTS in the mildest form, I don’t get the feeling like I am going to pass out episodes, but this fatigue and my legs. Yesterday I had to cancel my dentist appointment after work, I just had to go home and sleep, Diet and exercise is really important, since I have been healthier it has helped a lot. Hi great article! I hope you can answer a few of my questions. I did the standing test at home. My HR when lying down is 65 and it increases to 104 when I stand up. This meets the diagnostic criteria for POTS. However, I also seen to experience post exertional malaise when I experience a flare up the day after I try to exercise. I’m not sure if I have CFS or POTS or both. Do ppl with POTS experience post exertional malaise? Thank you!